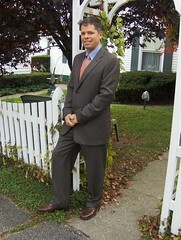 New Milford, Connecticut, September 30, 2006 - I don't get many opportunities to wear a suit these days. I have no dress code at work, I (thankfully) have very few funerals to go to, and the wedding invitations are petering out. This past weekend, we attended the only wedding we're going to this year, and just for the heck of it I bought a new suit for the occasion (the first suit I bought in nineteen years), and proudly kept it on throughout the ceremony and reception even though a very very (very) drunk guy kept hounding me to take it off. Well, just the jacket and tie, actually. But if I gave in to that, who knows, he might have convinced me to run across the dance floor in my underwear in no time. And that's not my job, that's the best man's job. The very very (very) drunk guy was an ex-boyfriend of the bride. As such, his job was to get very very (very) drunk and be a nuisance. Which he did rather well. He forgot to knock over the cake while loudly declaring his love for the bride, but otherwise, he performed spectacularly.